Brief overview of version history with information about new or modified functionality. Displaying information about schedules, cancellations etc. Warning messages for passengers and navigation to emergency exits. Navigating to the individual departments in the building, welcoming VIP delegations in the lobby. Welcoming VIP clients and guests, displaying consecutive numbers of the clients waiting to be served etc. Navigating through the building, navigating to conference rooms with presentations, restaurants etc. 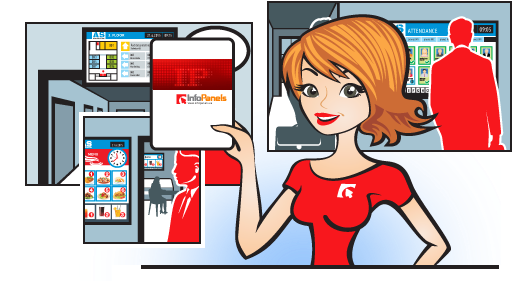 Try the most of the features of the InfoPanels for free! InfoPanels are extraordinarily efficient tools for fast, simple, and reliable data presentation; the system of digital display devices can be found in public areas, manufacturing areas etc. InfoPanels can display a video, text and graphics at the same time and it is also possible to insert online information into the layout (news, weather, television broadcast etc. ), to schedule a presentation or an advertisement. The InfoPanels systems consist of a computer with the Windows operating system for the respective software and display unit. Through InfoPanels, all hotel guests are provided with all the relevant information not only about hotel events or a network of hotels around the world, but also about attractive places around. In the hotel environment, digital signage has a non-negligible place, and the InfoPanels system can be usefull in the most luxurious wellness and spa hotels, typical city hotels and small tourist hotels and guesthouses too. The InfoPanels system can attract a wide range of audiences and therefore primarily finds use in busy places such as public buildings, offices, banks etc. At the same time, it can serve as a queuing systems. The wide area where the InfoPanels system can be used is education, all levels and fields. Each school facility still needs to quickly and effectively disseminate information about school events and all school-related activities. Where InfoPanels Can Be Used? The InfoPanels 6.3.8 is here! The InfoPanels 6.2.664 is here! Since 2017 we have an InfoPanel in the our café that helps us to promote our offer in the café, but also to promote it the products of our partners. Moreover, we can control everything with a simple and clear user interface at app.infopanels.eu. We can no longer imagine our coffee shop without an InfoPanel.